Join us for a local hike to the Blackledge Falls! 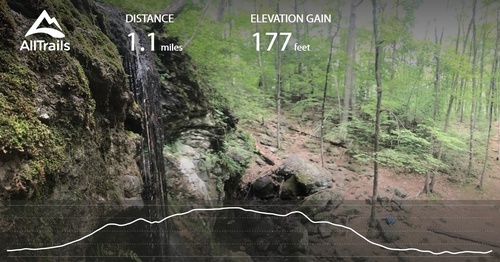 This is a relatively short hike to an impressive natural feature right here in Glastonbury. The hike will be about 1 – 1 ½ miles. We will determine our route the day of the hike depending on the trail conditions. We will hike at a moderate pace and expect the hike to last about an hour. 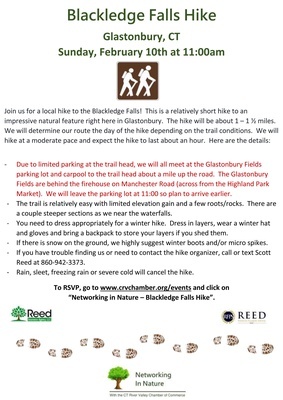 - Due to limited parking at the trail head, we will all meet at the Glastonbury Fields parking lot and carpool to the trail head about a mile up the road. The Glastonbury Fields are behind the firehouse on Manchester Road (across from the Highland Park Market). We will leave the parking lot at 11:00 so plan to arrive earlier. - The trail is relatively easy with limited elevation gain and a few roots/rocks. There are a couple steeper sections as we near the waterfalls. - You need to dress appropriately for a winter hike. Dress in layers, wear a winter hat and gloves and bring a backpack to store your layers if you shed them. - If there is snow on the ground, we highly suggest winter boots and/or micro spikes. - If you have trouble finding us or need to contact the hike organizer, call or text Scott Reed at 860-942-3373. - Rain, sleet, freezing rain or severe cold will cancel the hike. Due to limited parking at the trail head, we will all meet at the Glastonbury Fields parking lot and carpool to the trail head about a mile up the road. The Glastonbury Fields are behind the firehouse on Manchester Road (across from the Highland Park Market). We will leave the parking lot at 11:00 so plan to arrive earlier.